It didn’t take long into Avingard’s sprint when the archer above the wall noticed Avingard rushing towards him. The archer readied his bow and tracked Avingard, but the speed of Avingard made it difficult for the archer to get a proper aim, and soon Avingard was out of sight against the wall. Turning around, the archer signaled to the nearest bandit that an enemy was just outside the entrance. Huffing from his run, Avingard readied his sword and then moved to the entrance to assess the situation. He was immediately greeted with a blade that struck the wall next to his head. Avingard backed away from the entrance just as a bandit wielding a one handed sword cam sprint out of the entrance. Avingard immediately swung his sword, but just missed the bandit. The bandit swung his large sword striking Avingard’s sword, causing an ear-splitting clank to resonate off the wall of the fort. As Avingard recovered, and prepared to take another swing, a second bandit – an orc – appeared with an axe. Realizing that the odds in his favor were quickly deteriorating, Avingard swung his sword at the first bandit, striking him in the side. The bandit fall back against the wall in pain. The orc bandit took a swing of his huge axe at Avingard, missing him, but hitting the first bandit on the opposite side that Avingard had struck him. The first bandit fell dead to the ground. The orc bandit, shocked in disbelief at what he had just done let his guard down for a second. This gave Avingard a chance to swing his sword and strike the orc down next to the first bandit. By this time a redguard bandit, with a mace and shield, ran out from the fort and challenged Avingard. 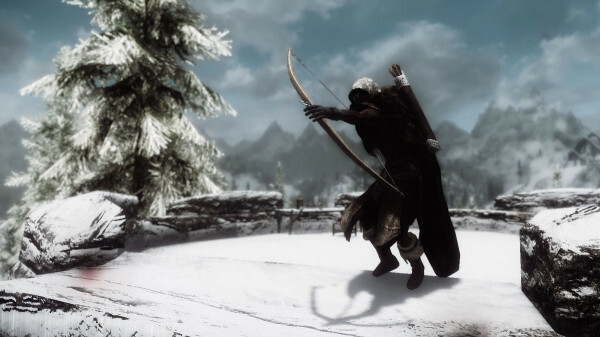 Before Avingard could mount an attack, a second redguard appeared – a female archer – that proceeded to ready her bow. Within a few seconds Avingard dodged the mace of the first bandit, and then swung his sword at the archer, killing her instantly before she could release an arrow. With the archer down, Avingard turned his attention to the first redguard bandit that was launching a second attack at Avingard. With his mace raised, he brought it down on Avingard, who just barely placed his sword in its path. The impact of the mace and his sword caused Avingard to fall back against the wall. The bandit had also fallen back from the impact. 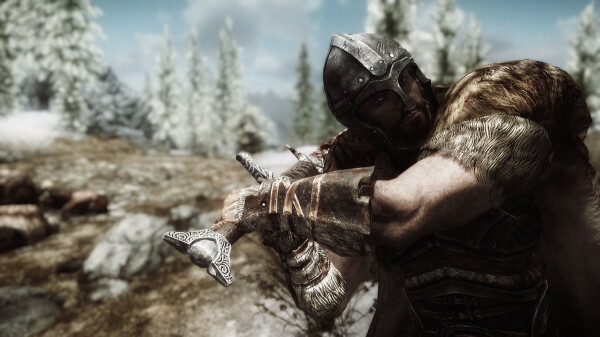 Before the redguard bandit could recover, he looked up and saw the large sword of Avingard flying through the air striking him in the neck and causing immediate death. Peering quickly into the fort, Avingard noticed no other bandits within the outer grounds, so he quickly searched the dead bandits and advanced into the fort. As he entered he turned around and looked up at the wall above the entrance, and noticed that the archer was not there. He immediately realized that the female redguard archer that had attacked him on the ground was the one from above the entrance. Feeling a bit more safe, Avingard made his way further onto the outer grounds of the fort. Just as he approached the large, rear tower he was greeted by an arrow that struck the ground beside him. Avingard looked to his left and spotted an archer on the smaller rear tower. Avingard needed to close the gap between him and the archer quickly, so he spotted a staircase leading up to the rear wall and ran quickly up the steps. The archer unleashed a second arrow that just barely missed Avingard. By this time Avingard had closed the gap enough that he could engage the archer. Panicking at the sight of Avingard, the archer tried to load another arrow but was struck down by Avingard before he could accomplish his task. Almost out of breath from the run up the steps and across the wall, Avingard turned and was greeted by yet another arrow, this one grazing his right arm. Feeling a tinge of pain in his arm, Avingard grimaced and searched around for his new adversary. High atop the large, middle tower, an archer was letting loose a second arrow. Avingard dodged the arrow and ran back across the back wall towards the doorway to the large tower. As he entered the tower Avingard could hear footsteps coming towards him down wooden stairs leading up to the top. Biding his time at the bottom, Avingard patiently waited until the archer came close enough on the stairs for Avingard to strike down with his sword. As the sword passed through the archer, the archer’s body went limp and fell the remaining few steps to the ground. After searching the archer for valuables, Avingard proceeded to climb the stairs to the top of the tower. Upon reaching the top he realized that no other archers were on top of the large tower. The tower provided a great look of the outer grounds of the fort, which Avingard determined was cleared of bandits. At the top of this tower he noticed a wooden table with two bows and some iron arrows. He took one of the bows and the arrows with him, and then descended back down the tower. Once he reached the bottom of the tower he made his way along the wall and descended down the staircase to the grounds of Fort Hraggstad. From there he made his way over to the doorway at the bottom of the large tower, and slowly opened the door and entered.